This deceptively thin book holds a veritable treasure of selected fairy tales and artwork, which give the reader a taste of the art and cultures of East Africa. The tales are mostly fables in which animals are ascribed human characteristics. In contrast with European fairy tales, which are primarily intended for children, African tales are also told among adolescents and adults: they are instrumental not only in educating the young but also in transfering and reinforcing societal norms and values. While older Africans are still familiar with these tales thanks to the African oral literary tradition, in large parts of Africa the influence of Western media has resulted in the decline and virtual extinction of this traditional transfer of knowledge. Missionaries, Africanists and Cultural Anthropologists have been able to gather and to put into writing the various existing tales and myths, striving to save them from oblivion. It is therefore one of the aims of this book to reintroduce these stories to the African societies from which they originated. The stories are complemented by outstanding examples of the Tanzanian art of block-painting (also known as Tingatinga painting), an art form which is still virtually unknown in Europe. Founded by the late Edward Saidi Tingatinga and further developed by his students, Tingatinga painting remains one of the most vibrant artistic movements in Eastern Africa. The painters illustrate scenes of everyday life, with a main focus on motifs drawn from the fairy tales and myths of their cultures. 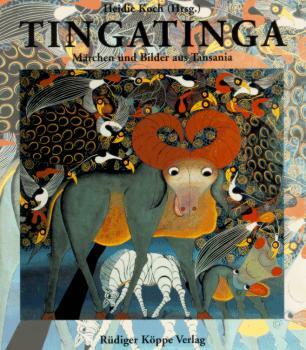 The book wishes to present these examples of East African stories and paintings to the interested reader and at the same time serve as a guide to the collection of Tingatinga paintings held by the United Evangelical Mission in Wuppertal, Germany.